The sign of the free Wi-Fi in Yasaka taxi. Kyoto-based Yasaka Group, which operates Yasada Taxi, has teamed up with Minato Ward, Tokyo-based UQ Communications Inc. to provide free Wi-Fi in Yasada Taxi vehicles used for its Kansai Airport Shuttle as well as the chauffeured Limousine Service for local sightseeing. The new feature became available on September 1. The Kansai Airport Shuttle gives rides between Kansai International Airport in Izumisano, Osaka Prefecture and Kyoto and the nearby cities of Mukko and Nagaokakyo. One-way fare is JPY 3,500 per adult and JPY 1,750 per child (under 12) and covers a trip between the airport and the passenger's home or accommodations. The company had received much customer feedback asking for in-vehicle internet connections because the travel time of around one-and-a-half hours "means we could make good use of that time traveling to Kyoto." Yasaka Taxi has answered that need by installing WiMAX mobile Wi-Fi routers. The company says it has also received many requests for internet access from international visitors to Japan. The new equipment is first appearing in 25 Kansai Airport Shuttles and five of the Yasaka Limousine vehicles, with further additions to be phased in gradually. Passengers are not required to sign a contract to use the connections. 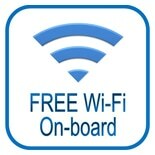 The Wi-Fi is provided free of charge to any passengers carrying Wi-Fi capable devices.